I had a nice lot of QSOs on day #337, largely on the higher bands again. I was up at a reasonable time and had a couple of CQ shouts on 10m, first working UV3QF, Igor and UA6BCB, Vlad. 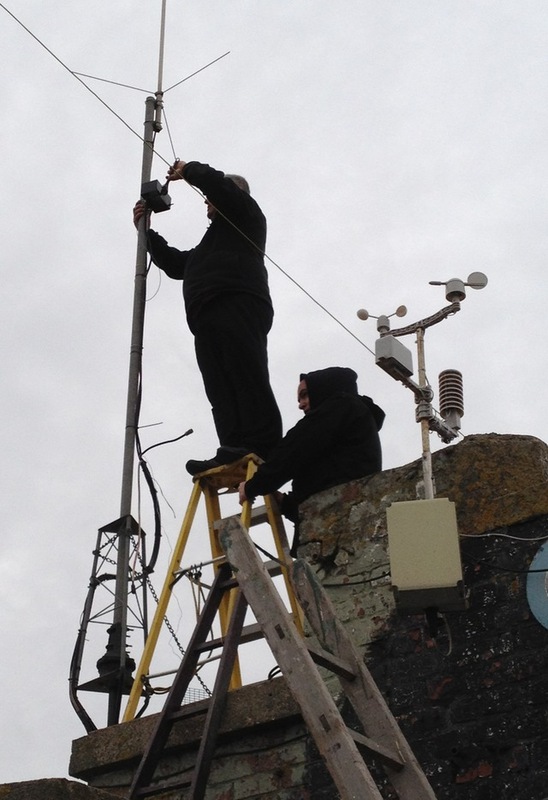 I was then nicely surprised to be called by ZL4CZ, Steven who was a nice loud signal and we spoke for a few minutes. After that I worked BV100 in Taiwan and then LZ1363PTT, Gosho. I then struggled through a pileup to talk to Nick, 5X1NH in Uganda for a new DXCC. That was a good one, he’d been calling and working split, first listening up 4kHz, then he changed to listening up 4-6kHz and then all of a sudden he changed to ‘up 8’. I twiddled the dial and he replied to my first call, commenting that I have good ears. It pays to actually listen to what the DX is saying and take action. After that I worked UP20PL and UP20BEW, both operators were called Alex and then I had a quick conversation with RZ9OZO, Alesha who is aged just six years old. I then worked UY2UQ, Vlad. Later I spoke with EE5URB and WB2YL on 15m before going back to 10m to first work N4ABN and EA8TJ using JT65 and then it was back to SSB to talk to K4NV, Dennis, WX3B, James and HR5/NQ5W, Roberto in Honduras for another new DXCC. After that I spoke to TA1BX/M, Burhan. 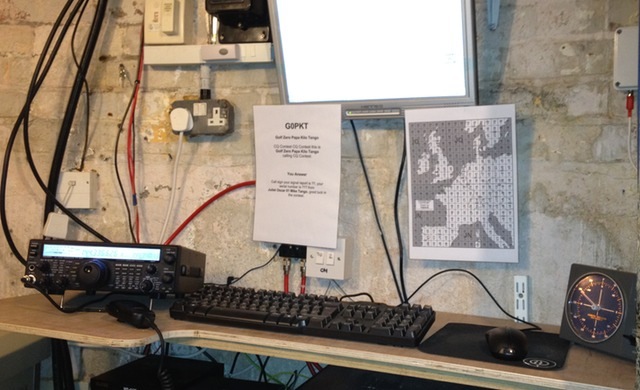 I later worked two stations on 12m, K8CW, Alan who is a Worked All Britain chaser and CT1AHU, Mor. I rounded off the day with a few QSOs on 40m SSB, IV3SUS, Savinio, OZ7AEI/P, Jakob, OH5NQ, Peter, M3HNL, Jim and G0VDP, Ken. 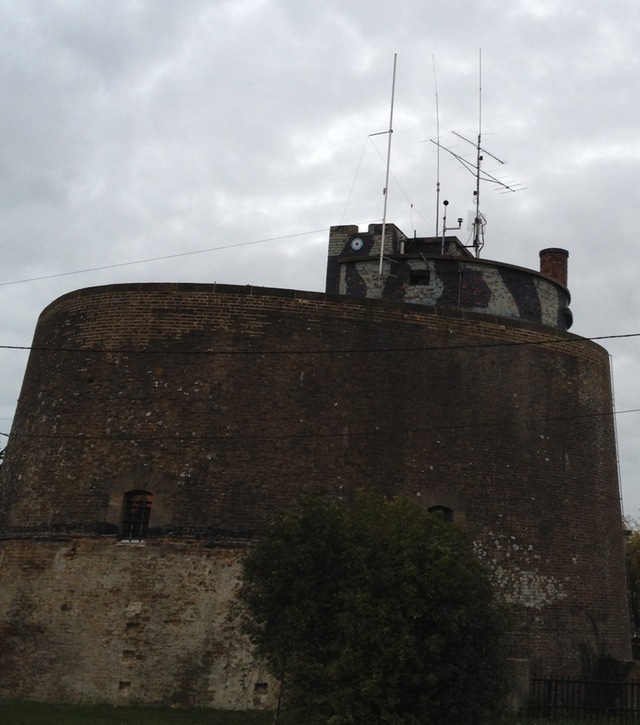 I spent a lot of day #338 at the Martello Tower where, along with other members of the Martello Tower Group we put our VHF/UHF aerials back on the roof in readiness for the 2012 contest season. I’ve already mentioned that we’re going to be taking part in the UKAC events in 2012 and that’s what this was for. The work should have been quite straightforward. 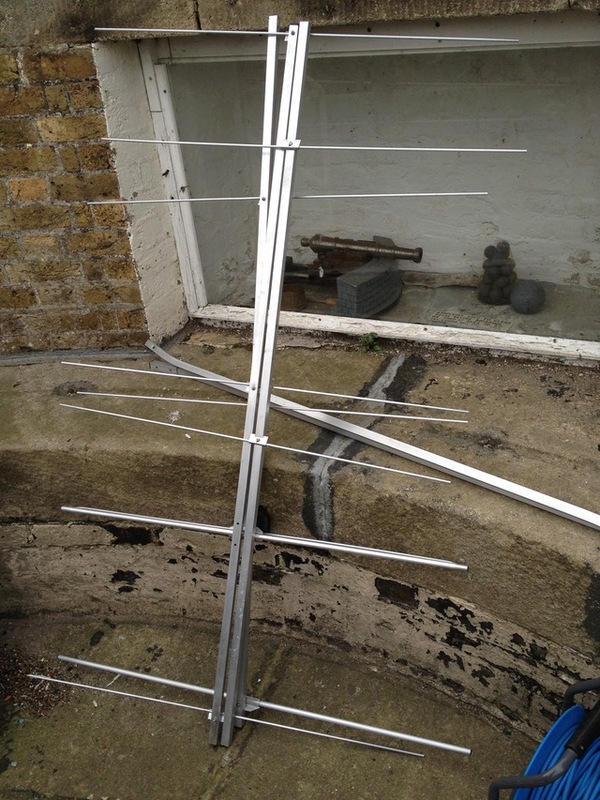 We were going to put our 19 element F9FT Tonna for 70cms up along with the 9 element Vargarda for 2m which used to be on the side of my house here. 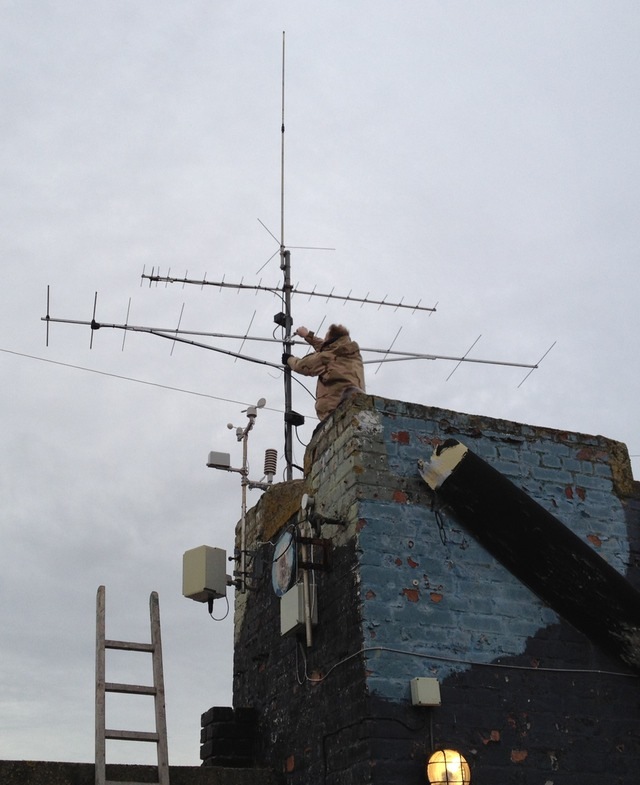 Colin, M1EAK had done a fantastic job cleaning up my old aerial which had been in residence here for over fifteen years. He’d done such a good job that it could have been confused with a new aerial! It was bitterly cold that day, it wasn’t possible to stand on top of the Tower for more than a few minutes without being in danger of body parts dropping off. Once done though we had a quick shout in the 144MHz AFS contest and worked 31 stations in 30 minutes with most of them commenting that it was nice to hear a new callsign on towards the end of the contest. From home on day #338 I first worked 5B4AGT. Arthur, RL3QCS, Slava and RA9OFE, Alex on 10m and then in the evening I had a few very quick PSK63 contacts on 40m in a contest. I only realised it was happening just four minutes before the end but worked UY2UQ, EA5XC, CT1EWA, UY7N and R7MM in those few minutes. I was filling out the log afterwards when I heard someone calling on RTTY and so I also worked EA7ST, Andy on 40m. The next few days only saw a handful of QSOs, largely using JT65, either early morning or late evening. I’ve had a lot happening over this period with radio club meetings, the regular weekly trip to my mum and on one day it was my daughter’s birthday so we were out. All these QSOs following except two were on 40m. On day #339 I worked AA0N, Michael and then WB4CIW, Frank and N4EKU on 20m. On day #340 I worked UA4ATB, Victor and W0LPD, Fred. On day #341 I first worked N9SOR, Charles and then YY2ACA, Tony. On day #342 my two contacts were on SSB, EA8CEQ, Manuel and S51CK, Ivan. On day #343 it was back to JT65 and I worked RW6AB, Alex, SV4FFK, Sakis, OZ1TMK, Torben, F5HRH, Pierre-Luc and F5RRS, Damien. 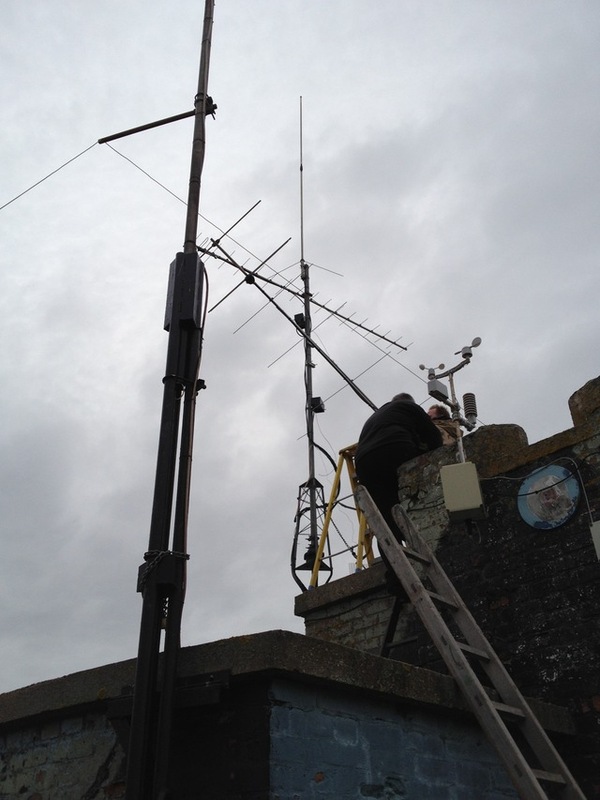 Going back to day #340, it was the final 144MHz UKAC contest of 2011 and we had a go in that. The contest started off very quickly with us averaging 1 QSO/minute for the first half hour and then it slowed down a bit. 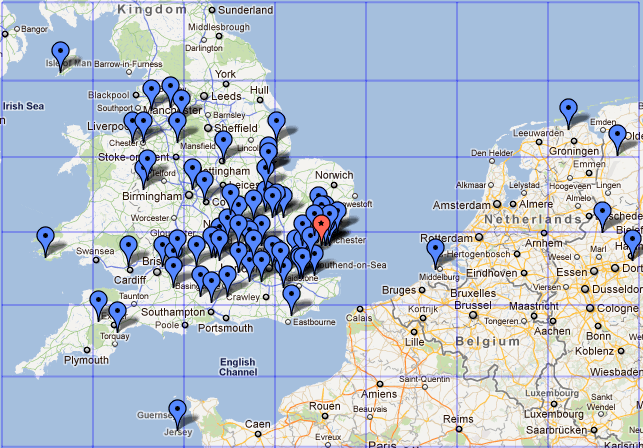 We ended up with 80 QSOs over the course of the evening and our initial impressions are that the station works very well. As a group we’ve bought a second hand FT-847 which is a significant improvement over the Icom IC-706IIG we were using before and my old 9 element Vargarda seems to work very well considering how flat the band was. This entry was posted in Amateur radio, Contesting, HF, JT65, New DXCC, PSK, QSO365, RTTY, SSB, VHF and tagged QSO365. Bookmark the permalink.